78x200cm Double sided retractable banner with custom printed graphics on PP material on sturdy aluminum base with carry bag. 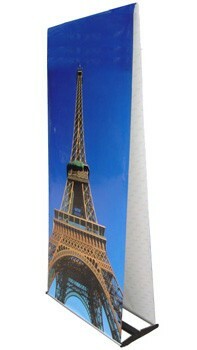 Our double sided retractable floor standing banners are very lightweight, sturdy, and professional looking. They are aluminum based with custom printed banners that can be pulled up on one or both sides of the stand for great visibility. With a double sided banner, one can easily carry one stand and have 2 banners displayed at the same time in a single space. It is great for trade shows, expositions, events, and retail store displays as it is easily portable when retracted. Set up is extremely quick and simple—extend the feet, extend the pole, and pull up the banner for a great eye-catching display. The banner includes a custom full color high resolution 1200 dpi graphic print (provided by the customer’s artwork) that is printed and pre-installed by Numart Display. The banner easily retracts back into the stand to prevent any creases and has great portability, especially with the included lightweight carry bag with shoulder strap. An optional spotlight accessory can also be added to the banner to bring even more attention to the display. Other sizes also available.